3DS Compatible flash cartridges can be used for playing NDS roms on 3DS. They can run commercial DS games, DSi games and DS Homebrew Apps on 3DS, but are not currently able to run 3DS ROM backups. Most likely for N3DS games we will need a new generation of R4 3DS flash cards. Nonetheless most teams have done a great job on updating their R4 DS / R4i DSi card firmware to make them 3DS compatible after Nintendo had blocked all cards from running on the new console. R4DS and R4i SDHC DSi flash cartridges that are confirmed to be Nintendo 3DS COMPATIBLE! These are listed in no particular order. - compatible with 3DS firmware v2.1+ without any updates needed. It simply works on the N3DS out of the box without any special updates or files needed. Could be that Nintendo simply didn't include this card in a 'black list' because they didn't get it before the release! - to avoid being blocked in a new N3DS firmware update AceKard Team has demonstrated that their card works BUT will release their update only after Nintendo has released EUR 3DS, so that N will not have a chance to test and block it. - these cards got the compatibility upgrade at the same time as the DS2 model did. - Support 3DS if You upload and run the latest kernel files. Also has anti-AP patching. - Same as SuperCard DStwo has a built in CPU for DivX, Avi playback and GBA, SNES emulators, but the support is not as good and up to date as with SuperCard team which this card was copied from. - another R4i card that has got the firmware update to make it support 3DS. more YouTube video proof of R4 DS Cards working on Nintendo 3DS and the firmware update files you need to copy to microSD card to make your flash backup device N3DS compatible. After you press on the icon to launch the game a flash cards game menu appears. Pokemon Black Version USA English and EUR, Final Fantasy: The 4 Heroes of Light, Kingdom Hearts Re: Coded, Okamiden, Lufia: Curse of the Sinistrals, Pokemon White Version (U) Rom English Patch, Golden Sun: Dark Dawn, FIFA Soccer 11, Super Scribblenauts, Sonic Colors. Download NDSL and NDSi ROMs for R4 DS SDHC DSi Flash Cards. Best Top NDS game direct downloads, RapidShare and Torrent links Pokemon Mario Dragon Quest Zelda GTA. Our R4 Games work on all Flash Cards & Emulators. Nintendo DS Emulator Roms = R4DS Rom files. It can be seen that the Nintendo 3DS has actually gotten a boost when it comes to its graphics. Players will see that if they try to play the PS2 Game Metal Gear Solid 3, it really looked even more superior as compared to that of the original game in PS2. In terms of the graphics, it will definitely be far off than that of the PSP2. The flight game known as the Pilotwings Resort was able to show off its remarkable profundity even though the screen is quite small. While flying around the game's 3D environment on a plane, you will see that the land below looks far away and the plane that you are riding in will simply stand out. It is also very easy to come up with opinions regarding the game as well. Since you will be equipped with the perception of doing things in real life, it will become more manageable for you to go through the hoops or go under the bridge. 3D has definitely paved the way for more possibilities when it comes to gameplay for the 3DS. As what Nintendo have said, someone playing as a shooter would just have to move the Nintendo DS around in order to control the game and explore the game's environment. You can surely imagine what it would feel like if it were to be combined with exceptional 3D visuals. On the 3DS, it will also be seen that the features for the wireless communication has also been enhanced. In this case, it will not automatically check on other similar units and try to communicate with it. This will allow you to exchange information like for instance the scores or the items. Though the DS has a feature quite similar to this, you would still have to quit the game that you are playing and go to the mode for special communication. The probability that you will come to a rage towards another game player through the wireless mode is unlikely. However, the Nintendo 3Ds s going to find other units so that it would be able to send and receive data for the games that you currently have without having to run any game. Currently there are no R4 DS flash cards that would be 3DS compatible for playing nds roms. But this may change very soon! The latest card from SuperCard team is really special. It has far evolved from your regular R4 DS. DStwo comes with on-board RAM and extra Processor enabling apps like Emulators for GBA roms on DS and more importantly DSi that has no GBA slot + a new SNES emulator for DS with games running at full speed with sound and lets not forget direct XviD, DivX and even FullHD video format support without reincoding on PC. NDS ROMs on 3DS with R4DS? SuperCard 3DS DStwo successor. New AceKard 3 and EZ-Flash 3DS rom backup flash carts. Cyclo3DS micro SDXC. Q: Where to buy R4i Gold 3DS and SuperCard DSTWO in Canada so that it is cheap + delivered quickly? As soon as there is first success in hacking 3DS a whole bunch of new 3DS Homebrew games and applications will appear and we will host them here for You to download. 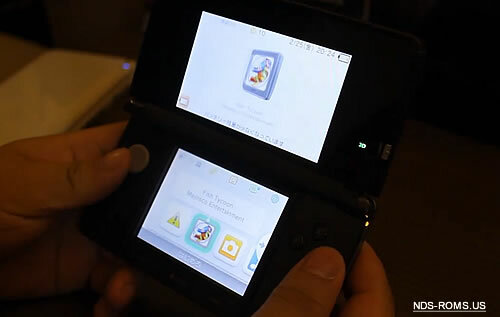 Even before first N3DS Flash Cards for playing 3DS roms are released - you will be able to download 3DS Games much like you could get PS3 isos before the PS3 USB Chip PS Jailbreak method was discovered and released. Check back here for the latest Nintendo 3DS Rom releases, N3DS torrents and reviews of best 3DS Flash Cards. Dead or Alive 3D, de Blob 2, Marvel Super Hero Squad Infinity Gauntlet, Professor Layton and the Mask of Miracle, Martha Stewart (hopefully prison-related), Sonic 3DS, Tom Clancy, Bloodrayne: The Shroud, Shin Megami Tensei: Persona, Contra.